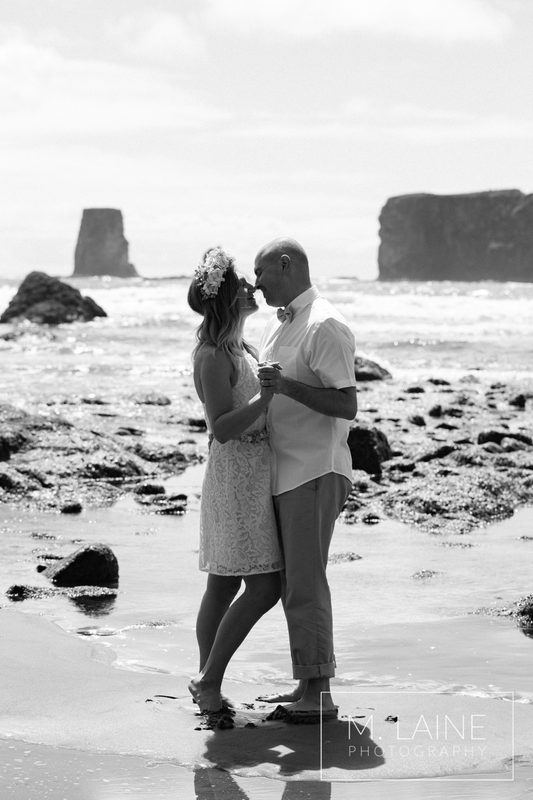 Jill loved the idea of taking the photos barefoot on a sandy beach, and I absolutely love the haystack rocks Washington has along the coast. The beaches along the Olympic National coast, provided the perfect combination of the two. Serendipitously, I met Tawney, of Tawney Rae and Co one week after scheduling Jill and Chris’s shoot. Tawney makes the most gorgeous vintage flower crowns and accessories! Once I saw her creations I knew a flower crown would be the perfect addition to our shoot, and it was a huge bonus to have a matching belt as well. We scheduled the shoot for mid-day, since that’s when Jill and Chris were able to snag a sitter for their four year old. Not one to volunteer myself to shoot in the mid-day sun, which makes harsh shadows (opposite of what is pretty in photos!) I was counting on the fact that most days spent at Washington beaches are overcast! Despite the weather not cooperating with my plans, we got some gorgeous images and I do have to admit, it is refreshing to have some blue skies in my photos again! Although this was a styled shoot, I appreciated that Jill and Chris took the effort to personalize it. Along with wearing their own elopement outfits, they also brought along a bowl and shells which they were given as part of a Hawaiian marriage tradition when they eloped. I had a great time soaking up the sun, hearing their fun stories and unique plans for the future – to elope in every state they visit! It was great to meet all of you and I hope you three - Tawney, Jill and Chris, enjoy these photos!